Ajanta: A Monk's Mission & a Maiden's Mystery! Product prices and availability are accurate as of 2019-04-18 12:45:36 UTC and are subject to change. Any price and availability information displayed on http://www.amazon.com/ at the time of purchase will apply to the purchase of this product. Author Bookstand is proud to offer Ajanta: A Monk's Mission & a Maiden's Mystery! by Bookstand Publishing. Bookstand Publishing offers books by the best indie authors throughout North America and the world. Bookstand Publishing is dedicated to offering original content to a broad audience and promoting great authors, literacy, and freedom of expression. 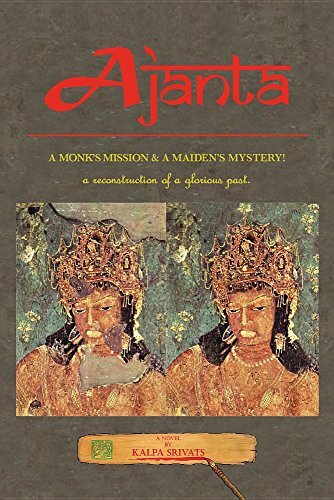 Ajanta: A Monk's Mission & a Maiden's Mystery! has generated a lot of interest and excitement and we think it would be an excellent addition to your library. The story begins on the day of Buddha-Poornima, a sacred day for Buddhists, in the fifth century CE. The protagonist Nandhini Devi, a charming girl in her 20s, encounters a soothsayer in her village and is perplexed by his predictions. Unforeseen circumstances put her in a Buddhist monastery where she gets special treatment from its head-monk, Buddhabhadra. The drama intensifies as she is sent to a royal palace to interact with the mighty Vakatakas. The plot unfolds through the interactions of the head-monk with the royal family, ministers, feudal kings and the girl. Unraveling her mysteries and fulfilling the mission of the Buddhist monk (bikshu) become the crux of the plot. Buddhist monastic life and the creation of the Buddhist cave-art at Ajanta, a World Heritage Monument of UNESCO, form the backdrop for the drama. This art historical novel places its fictional narrator in an accurate historic setting. Fifth century CE Jambudvipa, now India, marks the waning of the great Guptas and the apogee of the Vakatakas. Embedded in the socio-political climate are the cultural phenomena of India’s religions and arts. Nandhini Devi is caught in the politics of three kingdoms: the Vakatakas, the Guptas, and the Asmakas. The turbulent political situation propels a major war with the innocent girl at its center. Does she emerge unscathed or ruined by the political forces? Is she falling for the pleasures of royal life or leaning towards the rustic sobriety of a Buddhist monastery? Finally, who is she? Only the bikshu knows!